This past weekend many nature centers, birding groups and individuals began to take part in the 113th Christmas Bird Count – the longest-running wildlife census to assess the health of bird populations and help guide conservation action. Information here on the national Audubon site. From December 14 through January 5 tens of thousands of volunteers throughout the Americas take part in an adventure that has become a family tradition among generations. 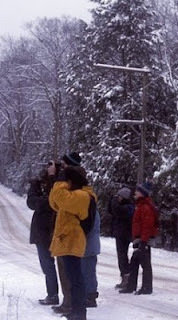 Families and students, birders and scientists, go out on an annual mission - often before dawn. For over one hundred years, the desire to both make a difference and to experience the beauty of nature has driven dedicated people to leave the comfort of a warm house during the Holiday season. Go to our TRC Facebook page to share stories about unique or unexpected bird species you saw!